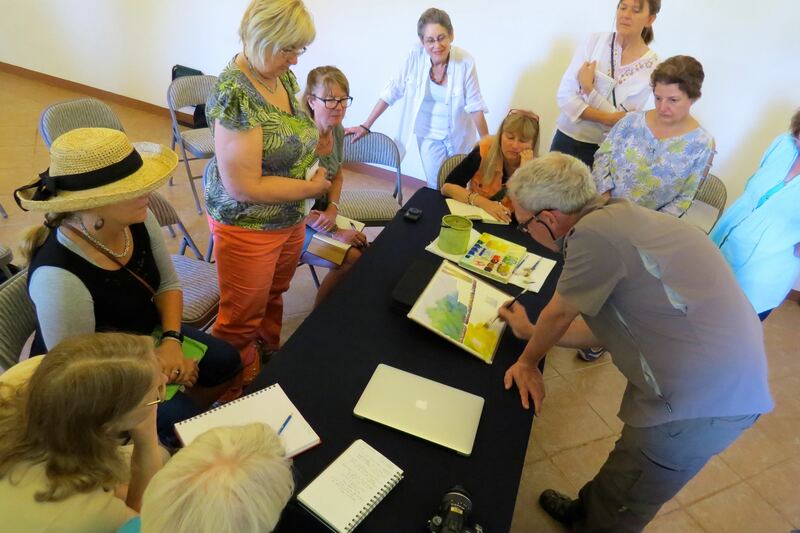 We convened at our studio, the Salon Aldama, on Sunday morning. 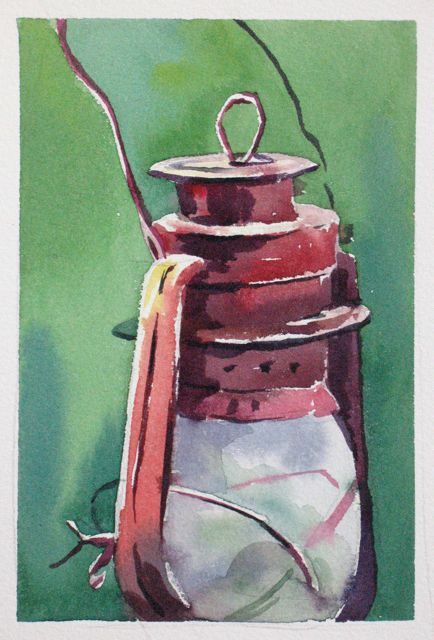 I did a sustained watercolour demonstration which I completed in a little under an hour. My demos aren’t always so long but I wanted to take the group through a process. Also, I talk throughout my demonstrations, sharing my thoughts and decisions. 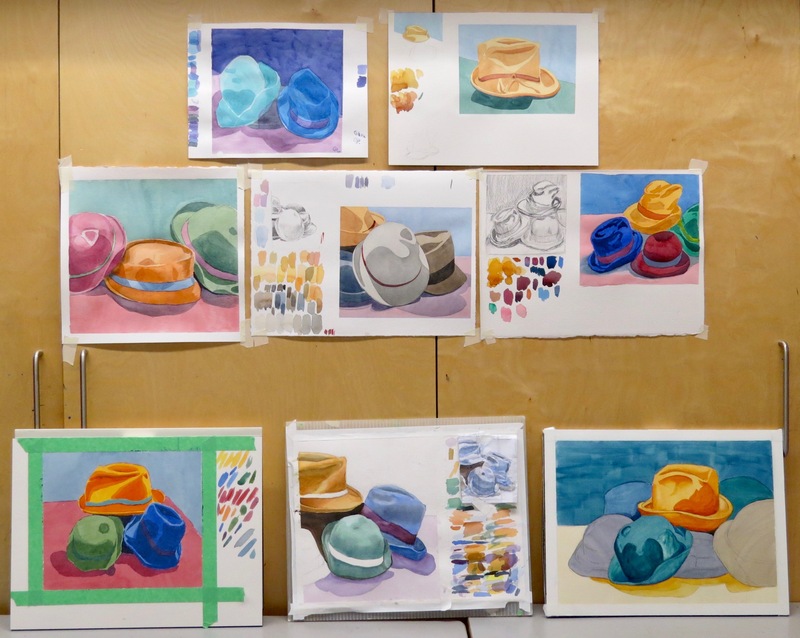 Sunday morning, I discussed everything from basic brush-handling to soft-edge technique and colour mixing. My subject may seem a bit unorthodox. It’s a view from our hotel parking lot. 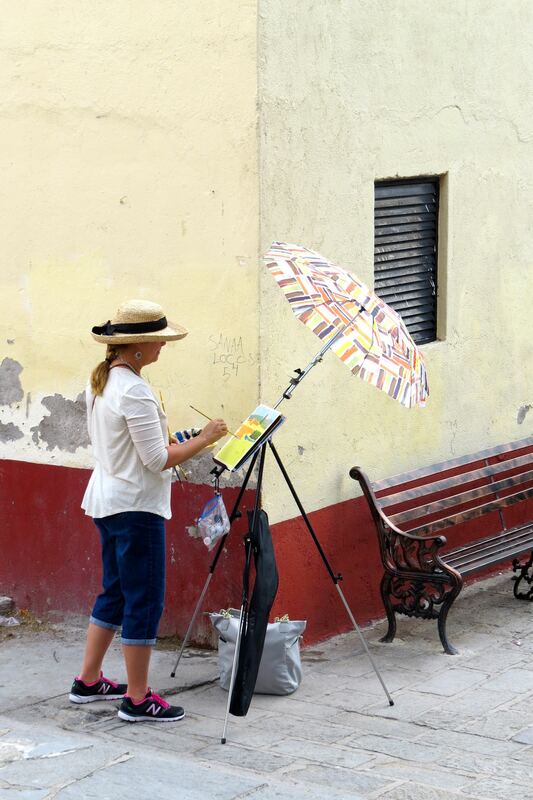 It has several elements, however, that we see from day to day in SM de Allende. 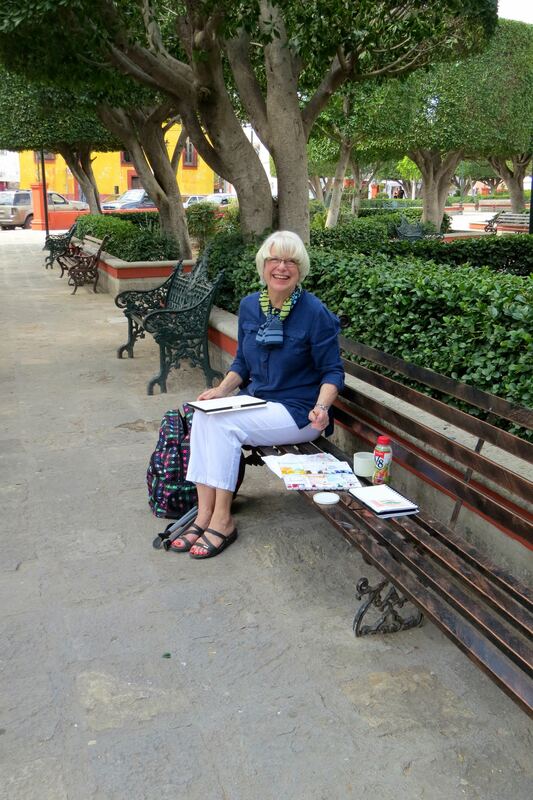 Our Sunday painting site was the park; Parque Benito Juarez. The park is a lovely green space surrounded by picturesque villas. It’s also adjacent to the outdoor public laundry where several of the students settled in for the morning. It was back to our hotel for critique at the end of the day. 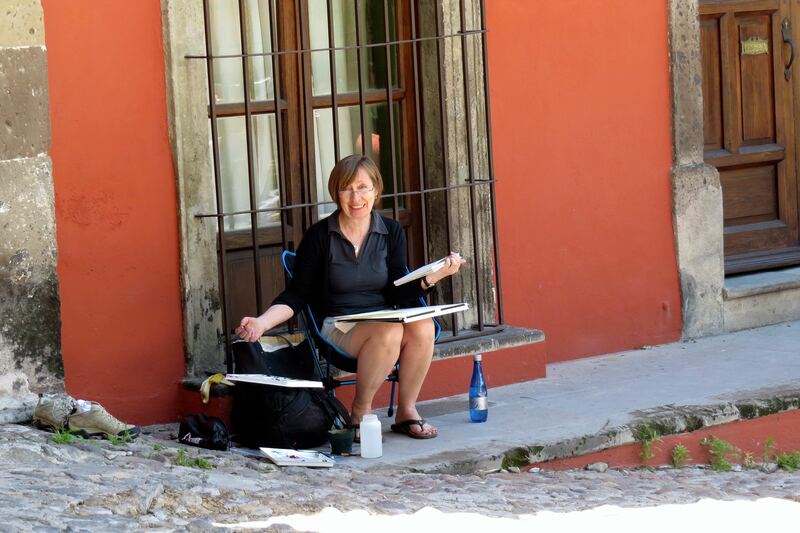 The focus of my Tuesday morning demonstration was on several of the things we see and deal with as artists every day in our ‘en plein air’ watercolour workshop. 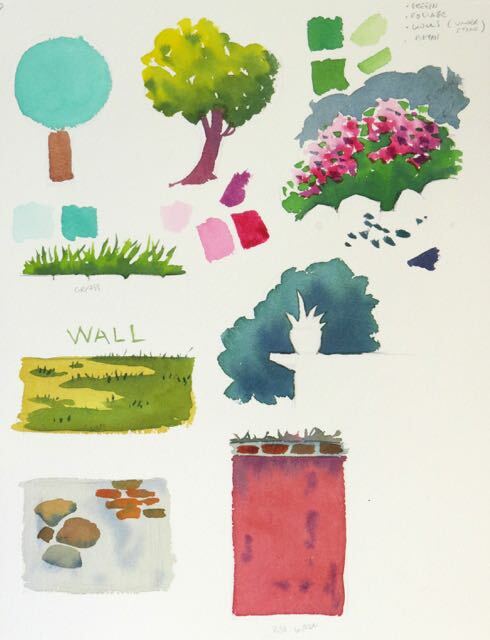 Flowers and foliage, stones and walls. 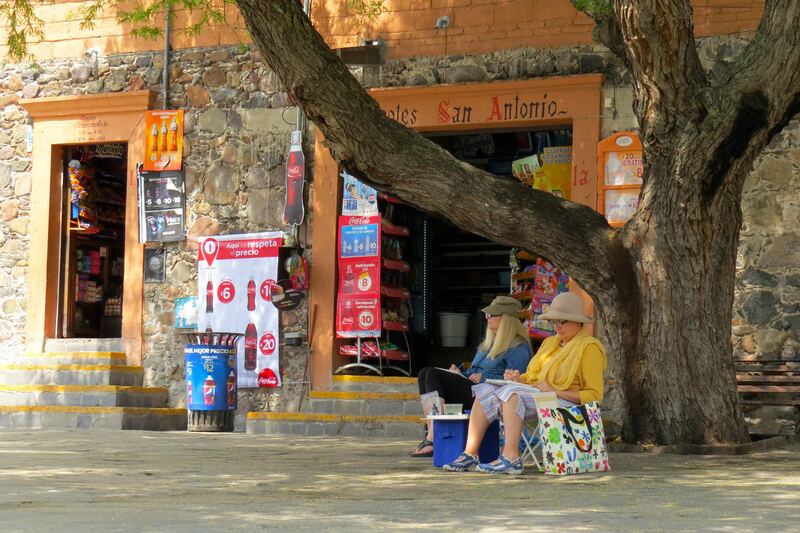 Our site was Plaza San Antonio, a quiet square off the beaten track, with a church and a small park. There’s a school across from the church and the attentions of the charming and well-behaved kids are always a treat. Everyone found a shady spot and got to work. Another great day and another critique. Lots of nice work! Everyone has been working hard and we all looked forward to our free day on Tuesday. 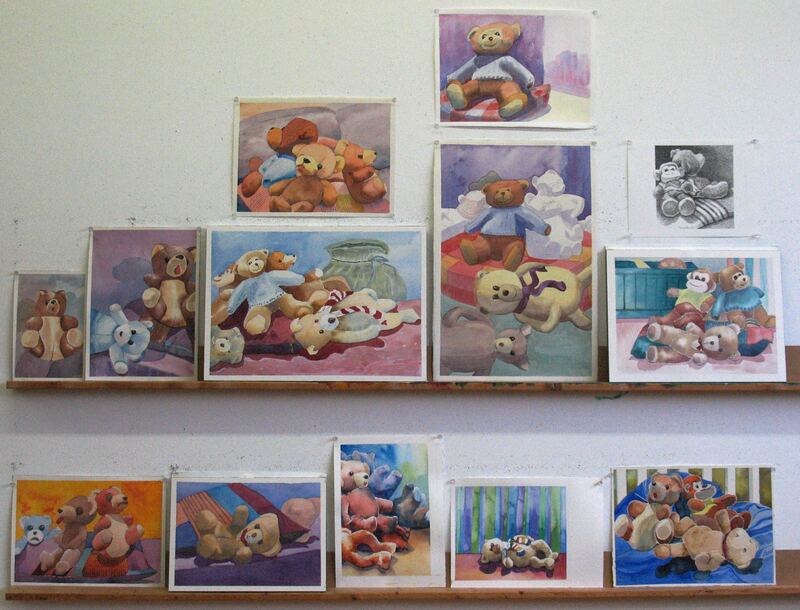 The Teddy Bear Picnic proved to be a week-long event at my studio. The Tuesday students had a lot of fun with them and the Saturday group came up with a few interesting interpretations of their own. I presented the same concepts in today’s demonstration as I had on Tuesday. We tried to break the bears down into their component shapes. This allowed more control of soft edge techniques. Simplification, as always, was discussed. 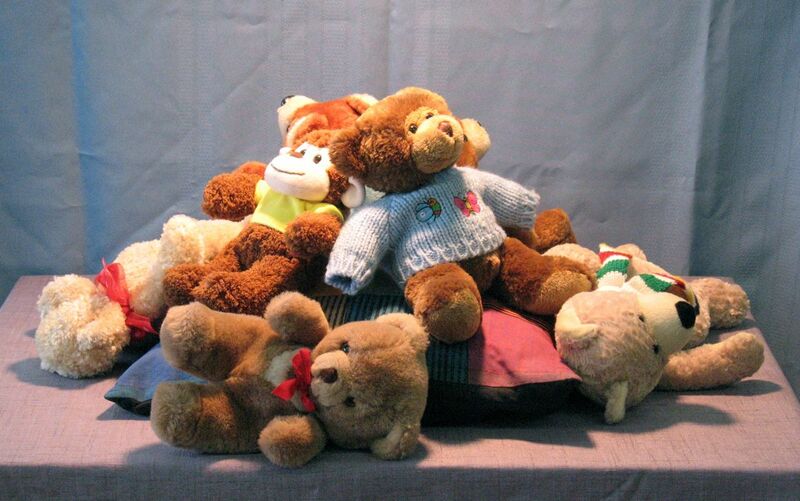 How can we suggest the full, three-dimensional quality of the toys with the simplest means? Did I say ‘a few interesting interpretations’? That might be an understatement. These imaginative visual solutions are worth a good look. Today’s still life could have caused a riot in the morning class but, fortunately, everyone had breakfast before coming to the studio. They’re not just muffins, though; they’re solid and relatively simple forms and they take the light well. I had a lot to talk about. 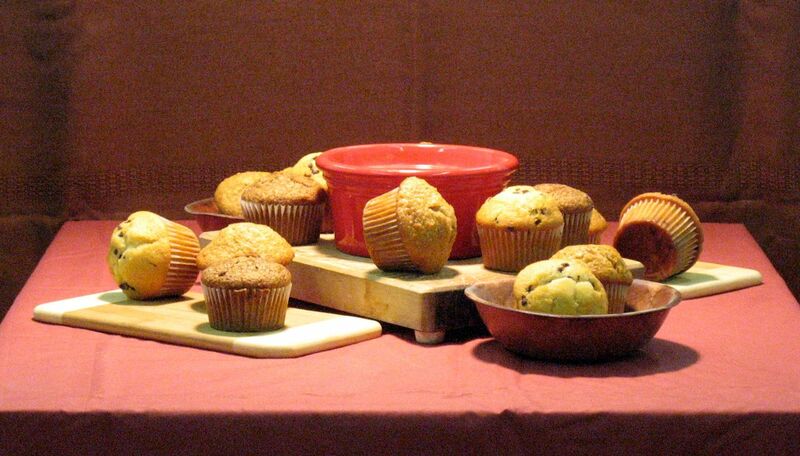 The studies in gray helped us analyze the basic volumes of the muffins. 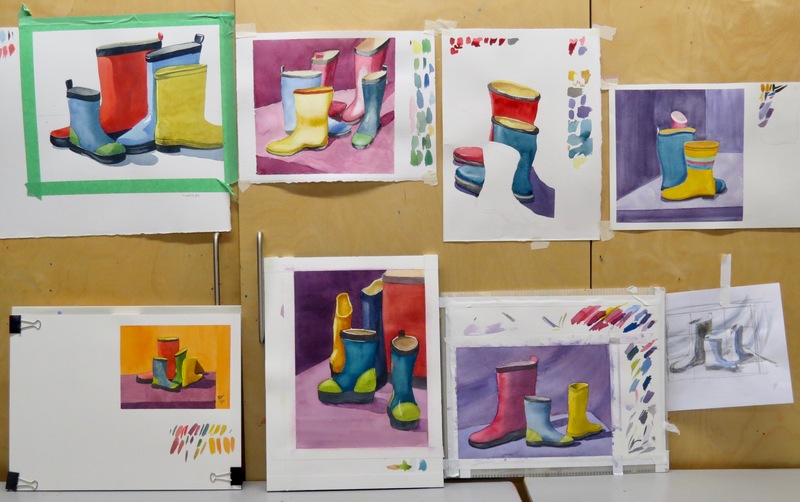 Colour and process were my main topics. I painted the muffins with primary colours. Anything on the sheet that looks brown was created with yellow, red and blue. All studies were approached with a ‘light to dark’ and ‘big to small’ process. In other words, the bigger shape of the top of a muffin was painted before adding the smaller chocolate chip or raisin marks. The wrapped area of the muffins was painted before adding the thin groove-like strokes. These smaller marks are generally darker in value than the area around them. 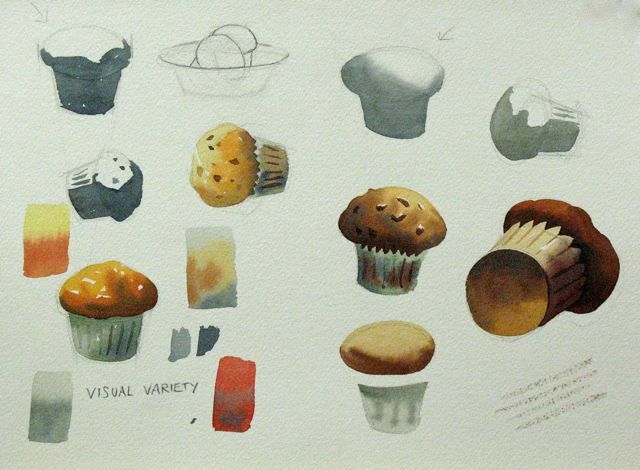 The muffin leaning on it’s side on the right of the demonstration sheet was inspired by Elizabeth H, a morning student. 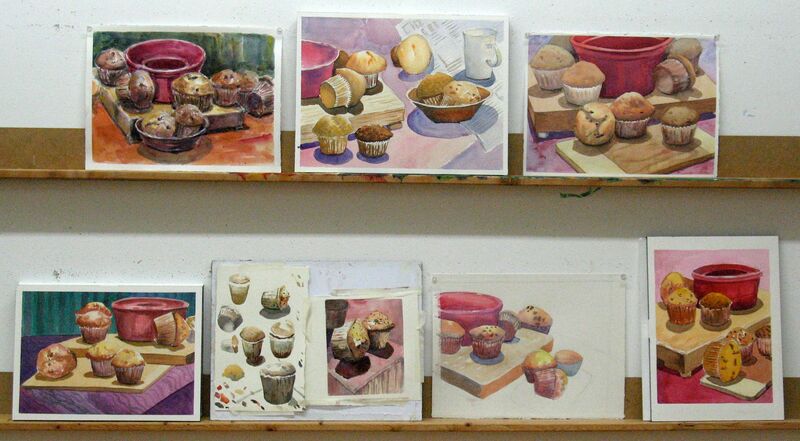 She did a very thoughtfully observed treatment of a similarly positioned muffin in her painting (upper row, centre of the AM critique). Elizabeth noticed that the ellipse of the bottom of the muffin was not an even value. It varies from dark to light. Also, the side wall of the wrapper alternates in value with the bottom. This gives a very three-dimensional quality to the form. I counted the muffins at the start of each class. As the muffins warmed up under the hot lamp the fragrance became more and more appealing. It was almost as good as a real bakery and I didn’t want the still life to be depleted by muffin monsters over the course of the day. 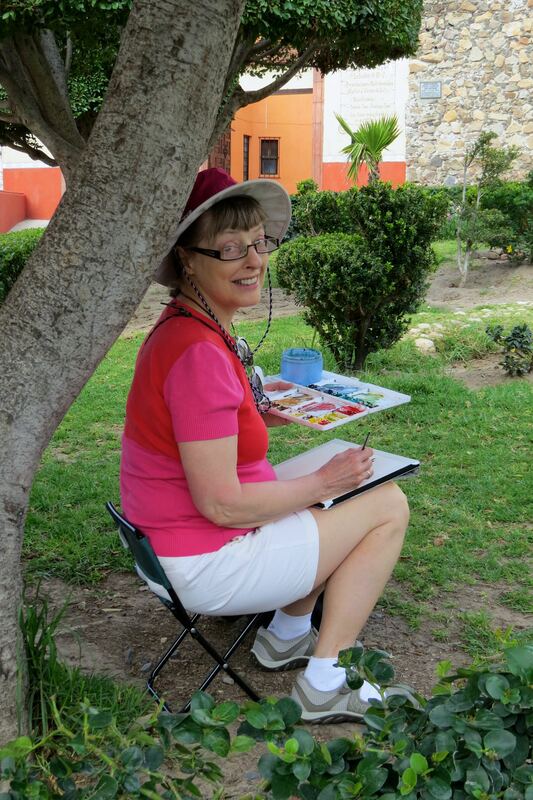 Tuesday Watercolour Class – Week Eight! 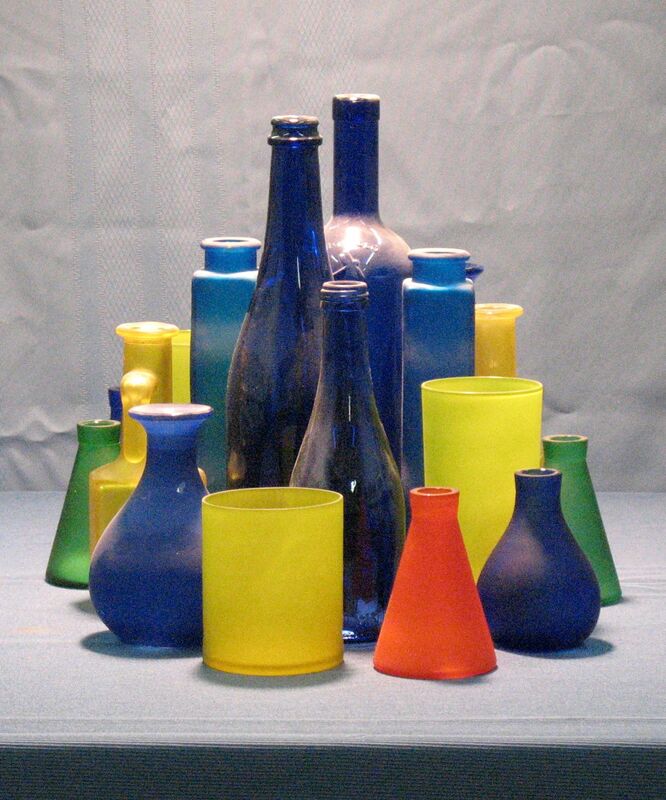 Do you see glass objects in our still life? Really? I see bright colours and interesting shapes. I wasn’t interested in discussing transparencies or reflections. 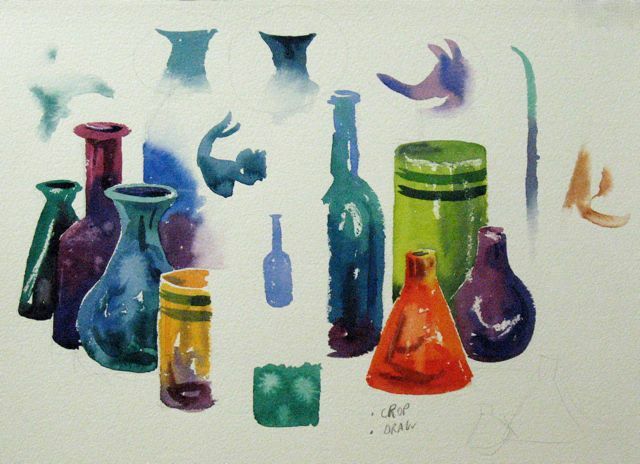 These bottles and vases are very familiar shapes and can be understood even as flat silhouettes. That makes them good subjects for a bit of play and risk-taking. My demonstration sheet may not make much sense so I’ll explain some of the ideas I presented. 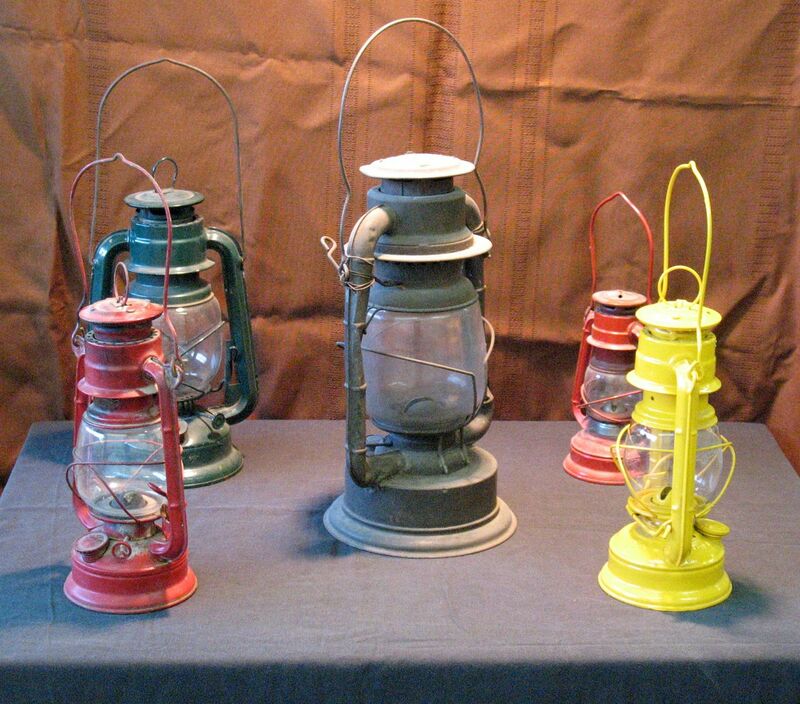 Wax has been used as a resist material in several places. I played with colour. 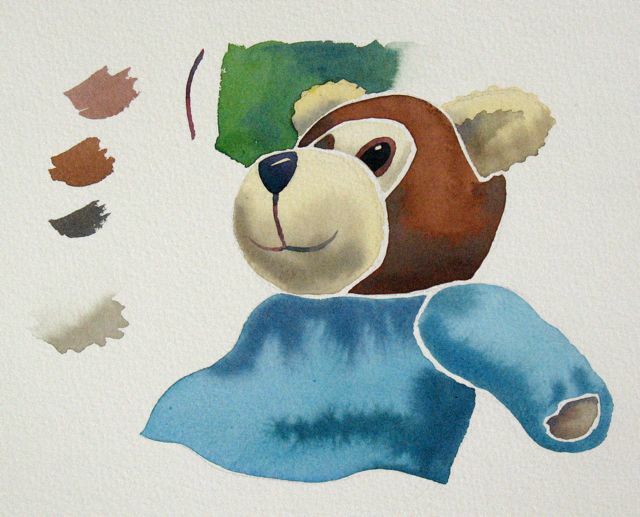 For instance, in some areas, I started with blue, switched to green while still wet and went back to blue. I dropped pure water into a few painted areas and deliberately created blossoms; like little snowflakes. The strange-looking squiggles and strokes can be added over a dry area of a vase or bottle to vary the surface and suggest form. 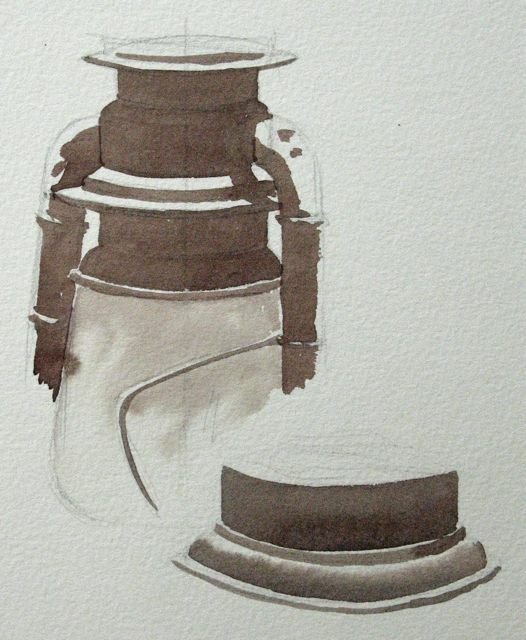 In general, I was making suggestions; ways to vary the painting process with the goal of creating a new look. As usual, the students responded with guts and flair. 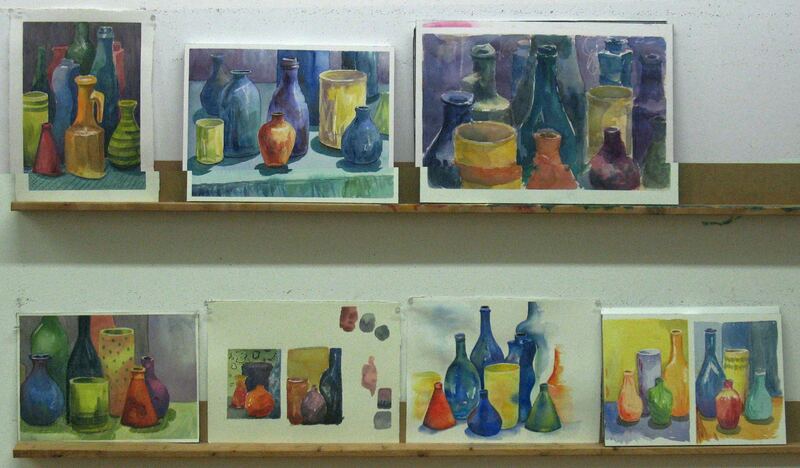 I can usually tell who painted each painting at the critique without any trouble. 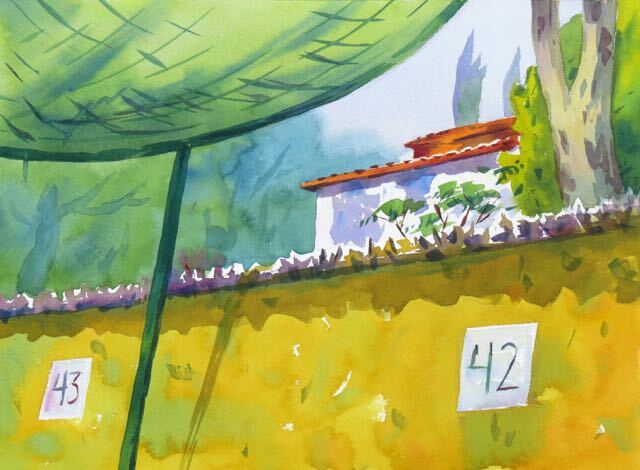 On days like this, with experimentation on the menu, it’s not as easy to assign each painting to it’s artist. Of course, I watched them as they worked but, if I hadn’t, I may not have been able to identify all of them. Success! New looks were achieved by trying new ideas. 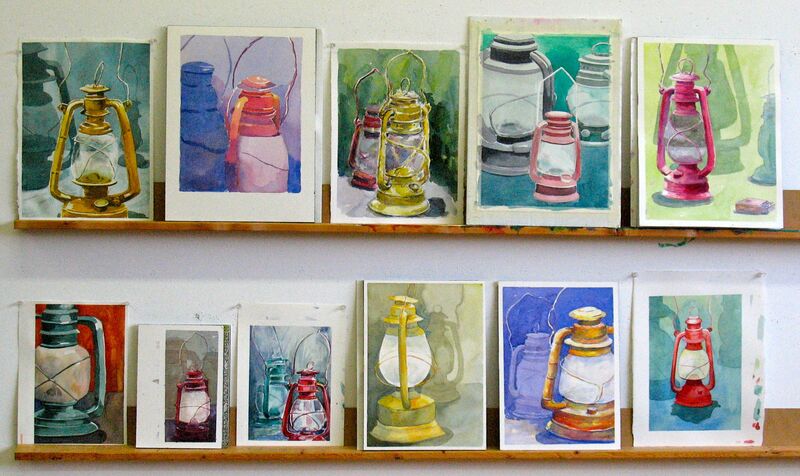 I’ve been collecting lanterns for a few years and decided that it was time to give the Tuesday watercolour students a shot at them. 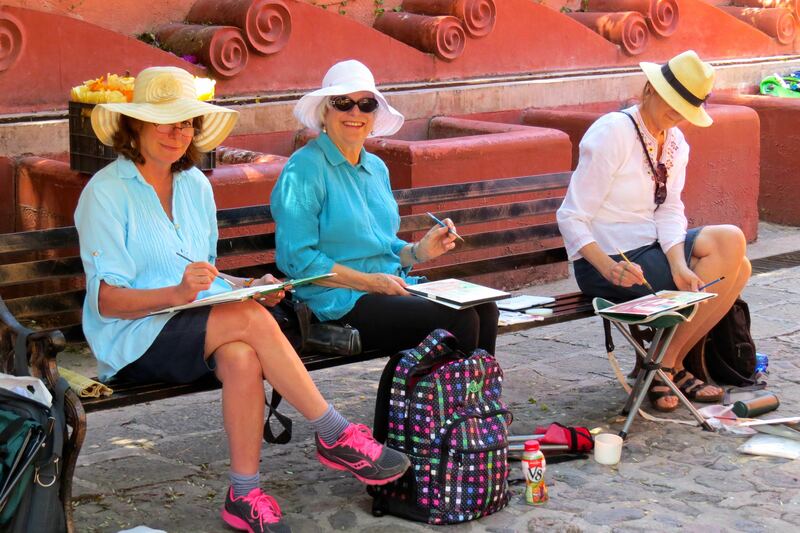 My morning watercolour demonstration is the red lantern on the left. 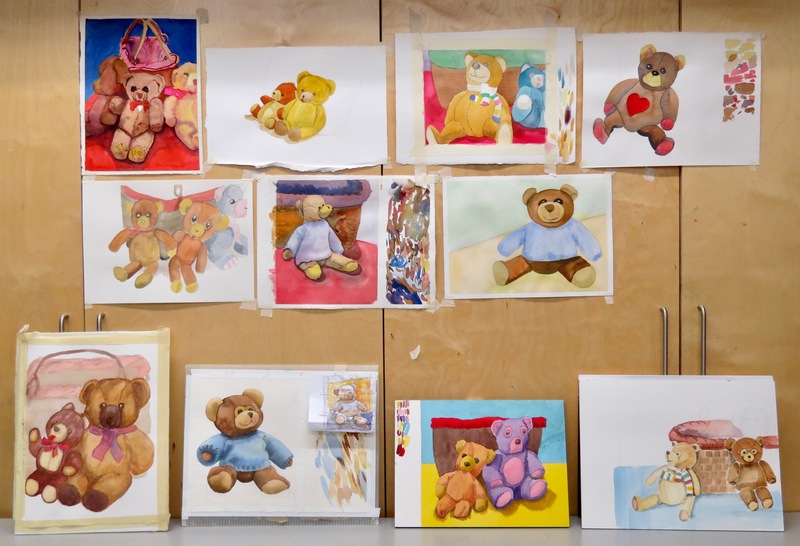 I painted the background first and suggested that the students carefully consider the ‘figure/ground’ relationship; the interaction between the objects and their surroundings. This important concept has been a theme for us for the last several weeks. 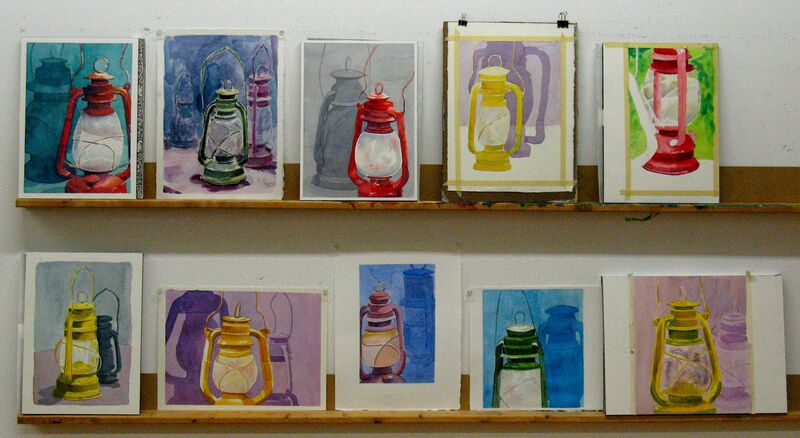 The morning group responded and did very well but there was a bit of a struggle with the basic structure of the lanterns so I started off the evening class with a monochromatic analysis of a lantern. Light and shadow to the rescue! The lanterns weren’t easy but they all work, don’t they? Most of the students focused on one main lantern, in the foreground, and added a silhouette or two to create depth and atmosphere. I didn’t really discuss colour so the artists get full credit for some of these very interesting colour choices and juxtapositions. Coombs at Pilar Shepherd Art Gallery! I’m now represented by Pilar Shepherd Art Gallery in Charlottetown, Prince Edward Island. Seven of my most recent watercolours, including CHAMPNEY’S WEST, NEWFOUNDLAND, are currently available for viewing and/or purchase at the gallery. 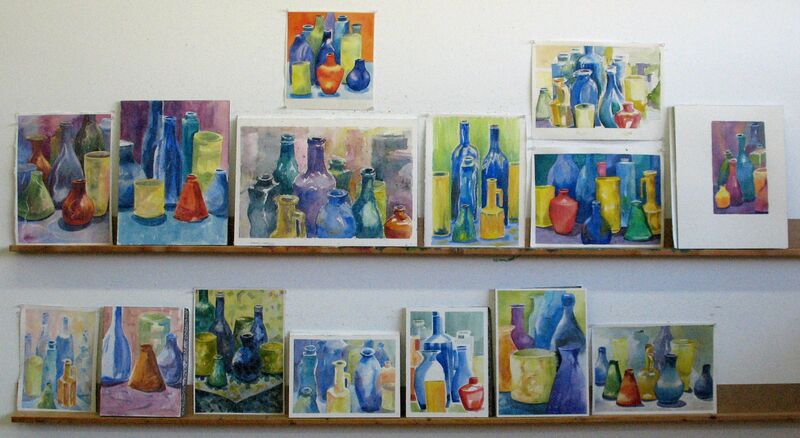 In addition to that, all seven can be viewed on the Watercolours gallery page of my website. 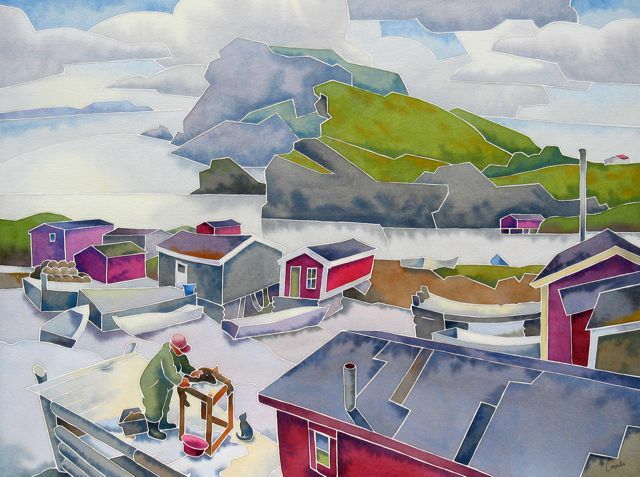 CHAMPNEY’S WEST, NEWFOUNDLAND is a watercolour on paper. The image size is 17 1/2 x 23 1/2″. The piece depicts a fisherman cleaning codfish. Residents are allowed to fish for cod, in season, for their own use. This beautiful village is a part of the Trinity Bight region on the Bonavista Peninsula. 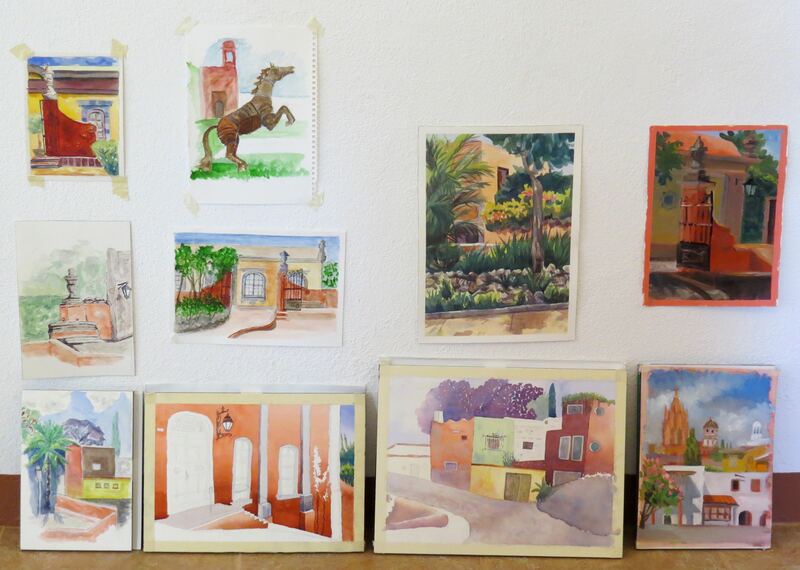 If you are interested in purchasing any of these seven watercolours, please contact the Pilar Shepherd Art Gallery directly using their Contact page. All of the work is framed and the gallery will deliver. I’m also represented by Earls Court Gallery in Hamilton, Ontario and Art Etc Gallery Shop at the Burlington Art Centre in Burlington, Ontario. Drop by if you’re in any of these neighbourhoods. They’ll be happy to show you my work.